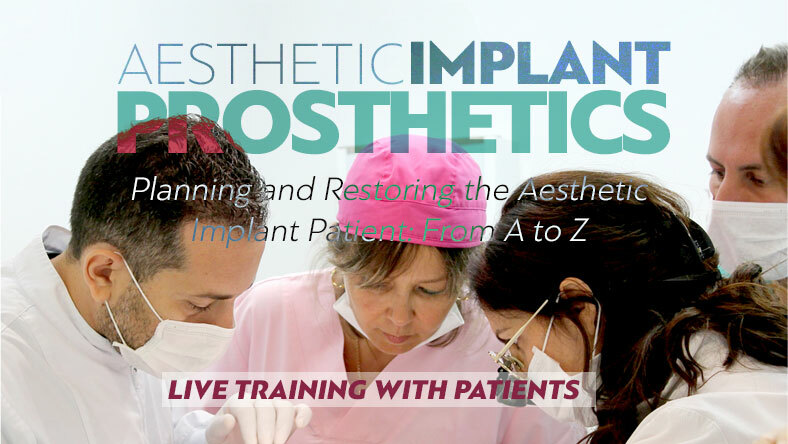 This clinical course is designed for dentists who wish to remain at the cutting edge of contemporary aesthetic implant dentistry. 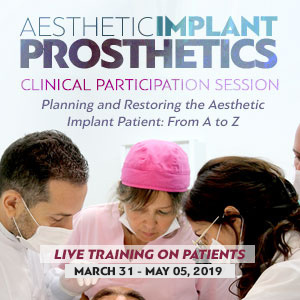 Every participant will restore directly implant cases on at least 4-5 implants and also assist and get involved in all group cases, under the trainer’s supervision. Types of cases will vary from single teeth in the anterior zone to full-arch/full-mouth rehabilitations. Live training on metal framewok try in. Clinical and radiographical evaluation of passive fit. Management of metal framework misfits. Live demonstration of the fabrication and the use of a verification jig. Evaluation of aesthetic, phonetic and occlusal function of implant restorations prior to delivery. Dr. Stratos graduated dentistry in Aristotle Dental School, Thessaloniki, Greece in 2003. He continued his education in Tufts University Dental School, Boston, USA where he received his diploma in the specialty of Prosthodontics in 2008. He was adjunctive clinical instructor in the department of Postgraduate Prosthodontics in Tufts Dental School. He is a member of the American Dental Association, the Academy of Fixed Prosthodontics, the American College of Prosthodontics and the Academy of Implant Dentistry. He has a number of publication in dental journals and presentations in dental congresses in Europe and USA. His private practice is in Thessaloniki Greece, limited in Prosthodontics and Implant Dentistry. Maria Gatou graduated from the German School of Athens (Deutsche Schule Athen). She received her Dental Degree (D.D.S.) at the Christian-Albrechts University Kiel, Germany. Maria Gatou completed her 3 year specialist training and the Master of Science in Prosthodontics at the Ohio-State-University, College of Dentistry,USA, in 1996. From 1991-1993 and 1996-1998 she worked as a Scientific Assistant at the University of Athens in the Department of Fixed Prosthodontics. She is member of the Homeopathic Academy and is currently attending a three year training program in accordance with the standards of the European Committee for Homeopathy (ECH) και της Liga Medicorum Homeopathica Internationalis (LMHI). She is fluent in six languages : English, Italian, French, Spanish and Portuguese and holder of C2 in German. Her private practice in Athens is limited in Prosthodontics and Aesthetic Dentistry. Ioannis Papathanasiou was born in Athens in 1988. He graduated from the Dental School of Aristotle University of Thessaloniki in 2011. During 2012-2015 he continued his studies as a postgraduate student in Prosthodontics in the Dental School of Univesity of Athens (UOA). He was awarded with IKY Greek State Scholarship for his postgraduate studies. He is an author and co-author of several publications on Prosthodontics and Esthetic Dentistry in international and greek scientific journals. He is a member of the clinical team of Dental Merimna in Athens and his clinical practice is limited to Prosthodontics and Esthetics.